TuffSkin Surface Protection has long served commercial clients such as hotels and bars. Now the company is branching into residences through an international network of dealer installers. "We're often brought in by designers and architects for surface protection," said Lelia Friedlander, principal of the family-owned TuffSkin Surface Protection, which is headquartered in Las Vegas. "It's time to expand our capabilities to serve a larger segment of the residential market." 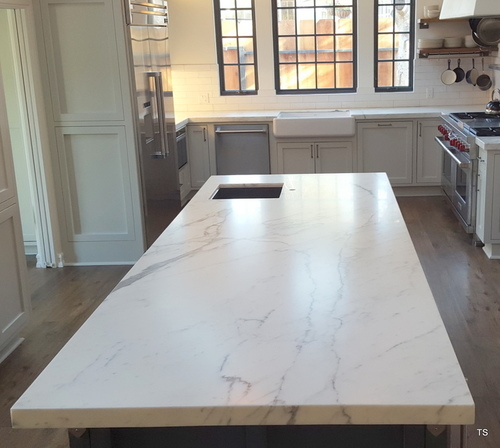 TuffSkin recently used TuffSkin satin on carrara marble by WesCan Marble in North Vancouver, British Columbia. Julie Porter, who launched Las Vegas-based interior design business Julie Porter Associates in 1989, has known the Friedlanders since 2007. She has recommended TuffSkin to her clients and colleagues for residential and commercial projects for years. "I love the way TuffSkin beautifies the stone and protects the stone," says Porter, who is president of the Interior Design Society's Las Vegas chapter. "Some of the most expensive onyx and marbles are so sensitive and can stain easily," she said. "But with a reasonable, fast process of applying TuffSkin to your expensive surfaces, you can sleep at night knowing they will always look amazing. My clients absolutely love TuffSkin. It's so easy on the upkeep." For more than eight years, architect- and designer-recommended TuffSkin Surface Protection, now available in gloss and satin finishes, has preserved surfaces in hotel rooms, lobbies, restaurants and bars. The company serves hospitality commercial and residential clients in the United States and Canada and around the world.